If you ever wonder why some boats don't get all yucky when they sit in the water, it's because grunts like me spend their spring Saturday's sanding and painting anitfouling paint on the bottom of their boats. 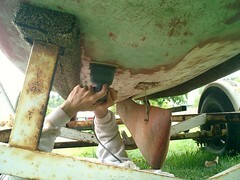 Today, Bjorn and I sanded the red bottom paint off the bottom of my Venture 17. We are going to paint it blue to go along with her new name - 'Blue Wing' (I'll explain in a later blog) Your arms really get tired after a while, so it was good to trade off with Bjorn. Later in the afternoon, Bjorn, Markus, Calvin and I went discgolfing at NAD Park in Bremerton. They had done a lot of clearing of the underbrush, so it had a much more open feel. It threatened to rain the whole time but held off until we stopped.